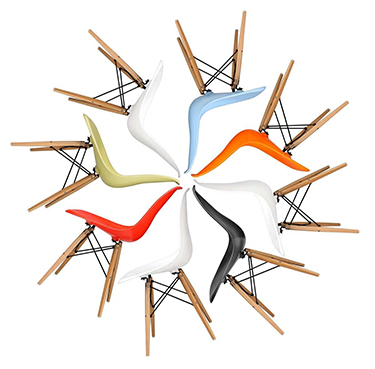 Bright and beautiful, our Eames Hang-It-All brings a touch of fun to any room. The shiny, wooden ball pegs add a splash of colour and were originally based on the solar system, molecular physics and bouncy space hoppers. Strong and durable, our Hang-It-All has 14 hanging pegs, giving plenty of room for the whole family's coats. And it's really easy to install, simply screw into the wall and you're done. Your room is suddenly tidier and your wall much more attractive. Created in 1953, the Hang-It-All is part of a variety of whimsical toys and furniture pieces that Ray Eames designed specifically for children. It all began in the 1940s when Charles and Ray Eames started designing colourful moulded plywood animals, building blocks and masks. The Charles Eames Hang-It-All was created to encourage children to hang up their belongings. The technology used on the Hang-It-All was later evolved to produce the couple's famous wire-based chairs and tables,which includes the DSR Chair, DAR Chair and DSW Chair. Nice product in reasonable price!! The product arrived quickly and well wrapped. We also have original and the color sequence is not the same. Additionally, the balls painted with matte paint, where the original is with glossy paint. Otherwise satisfied, except that the yellow ball had a small flaw in the paint. One can clearly see the difference when you put the original next to it, but it's still a nice rack. The product arrived in the promised time and fully lived up to expectations - I can at least not tell the difference between kopieen and genuine. The only reason I did not land on the 5 star is that one peg broke off when we were hanging hook up, but so far keep it with super glue! My first purchase on stin.com and not the last! Super fine processing. 3 in a row now adorns my time and is a delight to the eye. Missing a weld in one of the hooks that I bought, but otherwise, they came on time and are beautiful to look at and functional to use. Live up to expectation, we must now see if the welds hold. Just super happy with it. Good quality and well packaged. Super service, and it resembles the original. I am very happy, not the last time I will shop here. nice rack, but keep it? "Hi, Have received three paragraphs hang it all - they are beautiful, but on one broke a part of when I had to mount it without much stress ... it is a manufacturing defect? Otherwise they are really nice, so I hope they two others hold the fort ... "
Fine product that came on time. The only thing to comment is that some of the buds is more matte and more glossy and there were over glue out of a stud which was dried as a "drop" on one knob. Trades like this again. Love the product, really cannot fault it for quality and value, but we had to wait well over 3 months, after emailing it miraculously arrived a week later. Very pretty. The lacquer is slightly more than the original mat. Fine peg, very similar to the original. However, the painted wooden cups instead of the original plastic knobs and some loose.